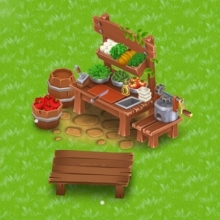 All salad bar goods will be worth +10% coins from car orders. All salad bar goods will be worth +10% experience from car orders. All salad bar goods will be produced 15% faster.